We regularly coach Master’s students from the MSc Programme Architecture, Urbanism and Building Science, with their Graduation theses. When doing their thesis with us, students benefit from the expertise of Co-Lab research group members. They also have the opportunity to disseminate their research through Co-Lab Research networks and the Co-Lab Blog, amongst others. They may also have the opportunity to integrate their research into ongoing projects within our group. Check out our current and past graduates and their work! After my Bachelors Degree in Architecture at the TU Delft I’m now graduating within the domain of Housing for my Masters Degree in Management in the Built Environment, with focus on the business models to develop co-living projects for young families in the big cities in the Netherlands. The Netherlands is facing a problem at the housing market. Middle income households often fall in the gap between the social housing sector and the market sector. The supply in middle income dwellings is to small and the price per square meter for market rental dwellings is about double the price for a square meter in the social sector (in Amsterdam). Young families do want to stay in the city and the municipalities of the big cities in the Netherlands support this. Cohousing could save costs and offers possibilities for young families to stay in the city, because of a cheaper rent. However, cohousing is hard to execute without the help of other people and costs lots of time. Co-living offers in this case possibilities, since co-living is executed by a somebody else then the future residents. Case study interviews with people using different business models to execute co-living projects and business data from developers will offer the data to determine the best business model to execute co-living projects. With this information municipalities could stimulate the market to scale up the production of co-living projects. This could be a part of the solution for the renting gap on the housing market and could make young families stay in the big cities. As part of her graduation within Architecture, Explore Lab, she will develop a method to help future residents and other involved parties of a collaborative housing group, to compile a clear and plenary design brief in order to create a coherent architectural design. After developing and applying this method, she will redesign a former school building into a collaborative home. Setting up a design brief is mostly neglected in collaborative projects. Often, future residents discuss their demands, wishes and ideas only amongst themselves during informal gatherings, even though this is an important factor in the eventual designing of their space. In her master thesis, Evi wants to develop a method to help future residents and other involved parties of a collaborative housing group, to create a clear and plenary design brief. By applying this method to develop the design brief, she will gain knowledge on the demands and wishes of future cohousing residents and supply further knowledge on the spatial and social dimensions of collaborative housing. After this, she will implement the results of the research and method into a design project. With these results, she will start the design of a fictional collaborative housing project. Recently graduated from Architecture and whilst working as a Junior Architect for NeutelingsRiedijkArchitects, Lisanne is graduating within the domain of Housing for her second Masters Degree in Management in the Built Environment, with focus on the influence of the rise of sharing economies onto the housing concept of shared living. Worldwide urbanization and individualization is putting pressure on the existing housing supply. A changing demand due to a changing economic and societal environment asks for new affordable solutions on the tight housing market. With the emerging sharing economy the rise of shared housing solutions becomes apparent. Co-living is one of the many shared-housing concepts that is emerging. 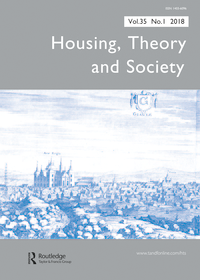 My research focusses on the economic validity of the co-living concept, in analyzing its ability to provide affordable housing whilst being profitable for its initiators. Through a global case study research, the concept is analyzed through its main characteristics and measured in its ability to serve either affordability and/or profitability as a housing concept. After finishing her bachelor in Architecture, Nina decided to do a double degree master programme at the TU Delft, studying both Management in the Built Environment and Science Communication. She is currently working on an integrated graduation project for these two masters, focusing on how sharing economy can be connected to cohousing initiatives with the goal of empowering their self-organization. The way we live is facing major changes. In the coming decades, there will be an increasing number of single-person households, especially in larger cities. This puts an even larger pressure on an already challenged housing market. Housing prices are increasing and the environmental sustainability of housing is under pressure. Collaborative housing poses a possible solution to these problems. However, self-organization of collaborative housing initiatives is troubled by financial or legal barriers, among other things. Connecting sharing economy to collaborative housing might provide an answer. Though sharing economy is on the rise, the connection between the concept and collaborative housing has not been explored. In my research, I focus on connecting the two by carrying out a case study, hopefully being able to understand how sharing economy can improve conditions for self-organization. After finishing her bachelor in Architecture, Suzanne did a master in Management in the Built Environment at the Faculty of Architecture of Delft University of Technology. She took an interest for the subject of collaborative housing and graduated February 2018 in Collective Private Commissioning and affordable private rental housing. Juan Carlos is an architect, born and raised in Bogotá. His growing interest in the way that diverse organizations come together to bring projects to life, led him to pursue a Master degree at TU Delft, where he graduated with a research on collaborative planning for urban regeneration projects in Latin America, focusing on a case study in Bogotá. Stephanie works as a trainee architect at Inbo in Amsterdam. She graduated with a MSc Architecture from TU Delft in 2016 on the topic of cooperative housing. She is primarily interested in researching the potential for cooperative housing models to create affordable housing in cities in the Netherlands.